In the West, light bulbs are iconic symbols of illumination. They also symbolize ideas, knowledge, enlightenment, modern progress, and the eureka! moment. They evoke our desire for innovative thought in constructively re-imagining contemporary life. Edison’s invention, may have different connotations in parts of the world that face minimal skills of reading and writing and lack of access to public systems of knowledge. The 2005 United Nations Development Programme Report on global literacy rates the nations of the world in a list of ‘most’ to ‘least’ literate. Using this list, Mark Soo began the development of his “Lamp” with the impracticable task of contacting the nations at the bottom, in an attempt to source, ship and display a light bulb originating there. 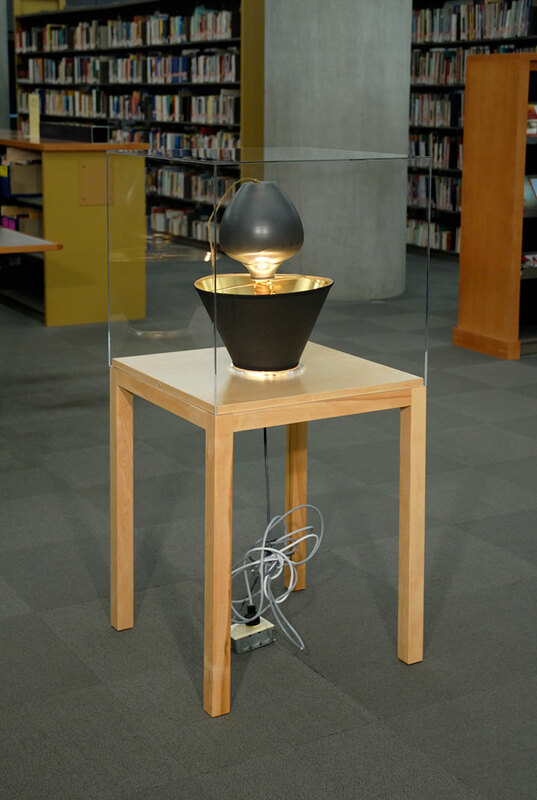 Fashioned into a reading light, the process of its acquisition reflects the many complex political, economic and social forces played out over both local and global spheres. As the library user pulls up a chair to study within the circle of light, we are made aware of those that cannot, (or those who read by candlelight, lacking access to electricity) and ponder a global economy that can distribute a standard product around the world but fails to achieve similar access to written knowledge. The Library’s commitment to free access to information and knowledge for all levels in the community is a testament to our society’s many freedoms and civil liberties, many of which we have come to accept as cornerstones of our social fabric. By inverting the logic of the ‘most-to-least’ index of the UNDP report, Soo’s work both honours the civic achievements of the library itself, and draws attention to the histories of colonization, empire and industry that have made these very achievements possible. Faced with the familiar, fragile light bulb, and an understanding of its origins, to sit within its glow is no longer a simple act, and its symbolic function becomes complicated by the contingent circumstances of its use around the world.